What the heck does Donkey Kong have to do with the practice habits of tai chi students? It turns out the ladders and platforms in the video game are a perfect model for understanding the ecosystem of students practice habits. Let me explain the survey design and then I'll share some really fascinating results about how people engage Brookline Tai Chi to develop their tai chi practice. Last week we conducted a small practice survey to try to get a more accurate picture of what students do outside of class. We sent out a request to participate to about 2000 people on our email list, and 30 completed the survey in detail. I then divided the 30 into 3 groups, to test the difference between two types of daily reminders and a weekly follow-up. The initial survey, sent on a Sunday, asked people about "typical" practice habits: frequency, duration, and content. I followed up on Friday with the same set of questions, but instead of asking what people "typically" practice, I asked them what they specifically practiced "last week". In between the initial Sunday survey and the follow-up Friday survey, 1/3 of participants received a daily email that said "Thanks again for volunteering to help us develop better practice tools for our tai chi community. I'm going to send you a little practice reminder every day this week and ask you about it at the end of the week. So...take a few minutes today to do some practice!". Another third got a similar email, but it included a link to a one-question survey: "what did you practice today?" The last third only got the Sunday and Friday surveys. Now, in this case, we actually know just about everyone who participated in the survey, but that's a good thing. We're not trying to run a randomized, controlled, double-blinded study. We're trying to gain deeper insight into our students' experience and develop tools for them that makes the practice more rewarding. So who participated? I was really excited to see that we got such a range of people interested in participating in this experience. It speaks to richness of our community that the request to "help us develop better practice tools" was embraced by people with so many different relationships to the school. There was also a category of what I think of now as "Super Practicers". Whereas most people reported on practice frequency as a number of days, these folks said "daily". As I watched their survey results come in and read how they talked about their practice, it was clear that their practice is so ingrained into their lives, that practicing for them is just like eating or breathing. Surprisingly, the amount of time the Super Practicers reported varied from 10 minutes to 2 hours. It wasn't like the 10 minute Super Practicer was yearning to be in the 2 hour category, though. It was just that 10 minutes a day makes perfect sense for the role practice plays in their life. 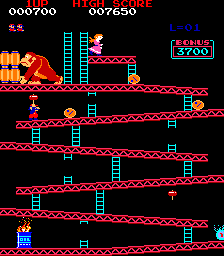 Ok, so here's where the Donkey Kong Model comes in. It was very clear that the students we surveyed fell into two different groups, which roughly matched up to how long they had been in their practice, but not completely. Some of the participants were actively engaged in learning new material, which is usually the choreography of a tai chi or chi gung set. The folks in this category who received daily email reminders to practice did more practice during the week than they thought they typically do. The folks in this category who only got the end-of-week follow-up did less practice than they reported initially. It seems clear from these results that when you are on the ladder of new skill acquisition, daily practice triggers help you get there faster. In contrast, we have the people who are maintaining a regular, ongoing practice. For these folks, there was almost no change in reported practice, whether they received daily emails or the weekly survey. To these people, the reminders were more of an annoyance (they told me so!). The conclusion here isn't that the tool is not useful, it's that these folks don't need an external reminder to perform something that is internally motivated. More importantly, seeing very little change in the Practice Plateau group highlighted the impact of the daily reminders on the Skill Acquisition group. The Donkey King Model is useful here, because over the course of your lifetime of practice, you don't just go through one Skill Acquisition Phase and one Practice Plateau. I like that image from the game of hanging out on a platform for a while, at a certain level of practice, before you embark on another climb up the skill ladder. From my own experience as a student and as a teacher, I think this is much more common. My intuition is that the daily reminder tool could be refined, if it's goal-specific enough, to be useful to anyone who is in a Skill Acquisition Phase, not just complete beginners. Where does motivation come from? I don't actually know for sure, but we learned some really interesting stuff about how people construct their practice. There seems to be a spectrum from internal to external sources of motivation. Again, this often correlated to how long people have been doing the practice, but not completely. Here's what I mean: when people first walk through the door to learn chi gung or tai chi, they need external motivation: they don't have the right information yet, they don't know what to practice, and they don't have any practice habits yet (for this art). As you climb one or two skill ladders, you start to feel the benefits of practice. You no longer practice "because my doctor told me to" or because "I saw people doing it in the parks in China". Instead, the practice starts to satisfy you on some level. At this point, we see some branching. There are a small number of people who take one course and then go off and practice on their own forever. To me, they've abandoned all of the external motivation we can provide, and made regular practice 100% internally driven. More often we see students who are happy to have the social support of classmates, a physical place to practice, and the guidance of an instructor -- all external motivators --- to keep their practice going. Many slot into this relationship with the school indefinitely. One of our instructors tells a funny story where a friend of hers, on hearing that she's been coming to classes for 15 years, said "Don't you know it already?" That's a perfect example of assuming that long term practice is one big skill ladder to climb. It's not. The practice plateaus along the way are not the same as the linear climb to skill acquisition and part of what a community like Brookline Tai Chi offers is not only external motivation, but external connection -- to people and a place. Any progress we make developing practice tools for our students will have to consider all of these factors, internal and external motivators, phases of skill acquisition and even the satisfaction of practice plateaus. That brings me to the most surprising result in our survey. Many of the participants fell into the Super Practicer category, with extremely high internal motivation to practice, and in some cases no immediate geographic proximity to the school. By all appearances, this is the group who has moved on from everything we have to offer -- weekly classes, skill ladders, a space, people to practice with, instructor feedback . So why did so many of these folks respond to a request to develop practice tools for our community? In one sense, they appear to be the least connected to the day-to-day activities of the school and the least in need of help with practice, but they all responded to our request and gave a tremendous amount of insight into their practice habits. It's going to be a huge payoff for me when we finally figure out what makes these folks tick.